A filling is a material that is used to repair a tooth that has been affected by decay, cracks, fractures or worn enamel. 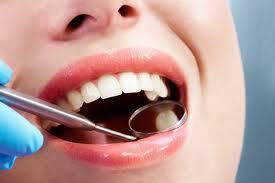 A filling is most commonly used when you have a cavity. Cavities are caused by plaque building up on your teeth and causing decay, which can create holes or structural damage to the tooth. 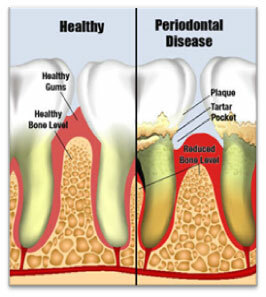 Cavities can be discovered by the dentist when examining the mouth visually and with the help of X-rays. To restore a cavity, the dentist will numb the area surrounding the tooth with a local anesthetic. This will decrease the chances of feeling any discomfort during the procedure. Any area of the tooth affected by decay will be removed and replaced with white, mercury-free composite material. An LED light is used to harden the material within seconds. The dentist will shape the material so that it looks and feels like your original tooth. This composite material can also be used for bonding and cosmetic restorations. Most dentists will preform root canals, however depending on the condition of the tooth and the shape of the tooth and roots, you may need to see a specialist. An Endodontist is a dentist that specializes in dental pulp and has the necessary tools that a general dentist may not have. You can expect your root canal to take several hours or a few appointments to complete. It is very important that you finish the procedure once it is started or you will risk losing the tooth completely. A post and core is used to build up the tooth’s structure, making it stronger. 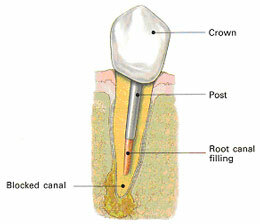 A post and core is most commonly used after Root Canal Therapy. The dentist will remove the filling material placed in the root of the tooth. The dentist will then fill in the area around the post. He will either shape this to look like your tooth or a crown will be placed over the tooth.